This post is sponsored by Horizon Organic. Easy White Cheddar Mac and Cheese with Caramelized Broccoli and Mushrooms is a wholesome, delicious and simple mac and cheese dish made with Horizon Organic Pasta Shells & White Cheddar Cheese, caramelized broccoli and mushrooms, and a crispy cheesy panko crust. If there's one thing I love, like really, really, really love, it's macaroni and cheese. I have said forever that one of my very favorite meals is my Momma's Baked Macaroni & Cheese made with sharp white cheddar and stewed tomatoes. I would request it every year for my birthday dinner when I was a kid and I swear I could eat it every day for the rest of my life. Gah, it's so darn good. I completely adore my Mom's recipe, but sometimes I like to make a creamy baked version like The Creamiest, Cheesiest Baked Mac and Cheese made with yellow cheddar and a crispy breadcrumb top, which is the way my husband likes it. Got to keep my honey happy, right? Both of those recipes take at least an hour to make from start to finish, which kind of rules them out for a simple weeknight dinner. And isn't that the dreaded question most moms face every day in this country? What’s for dinner? Well, I have have good news for you. The good folks at Horizon Organic have come up with an awesome new mac-n-cheese recipe generator that will help make your life (a little) easier! Parents simply select the ingredients that are already sitting at home and the MAC-N-ATOR will generate a mac-n-cheese recipe using Certified Organic Horizon Mac & Cheese. That means you can make a yummy, cheesy, wholesome macaroni and cheese that you and your kids will love any night of the week. Because you're using the Horizon mac-n-cheese, it all gets done in less than 30 minutes. Perfect! I decided to use fresh broccoli and mushrooms as an add-in. 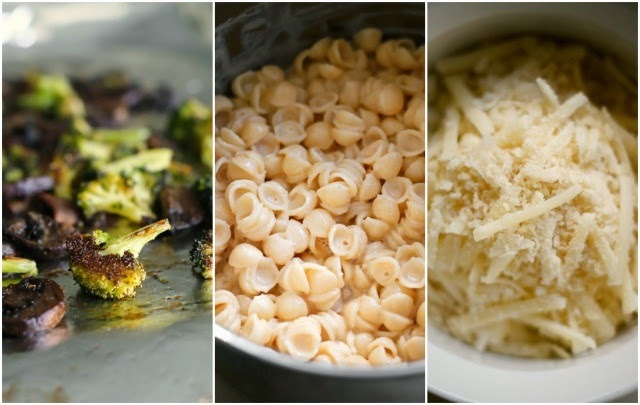 Our family's favorite way to eat both broccoli and mushrooms is caramelized, so marrying Horizon's Pasta Shells & White Cheddar Cheese with roasted veggies sounded absolutely scrumptious. I also decided to add that crispy cheesy panko crust my husband loves! That, my friends, is why the MAC-N-ATOR is so cool. It will give you tons of ideas like this one on how you can combine what you've got on hand with tasty mac-n-cheese. Win-win. You should totally try it out! Preheat your oven to 425 degrees. Place the broccoli and mushrooms onto a baking sheet lined with foil. Drizzle with 3 tbsps olive oil and season with salt and pepper; toss to coat. Cook the mushrooms and broccoli in the pre-heated oven for 15 minutes, stirring once halfway through the cook time. Meanwhile, cook the macaroni and cheese according to the package directions. 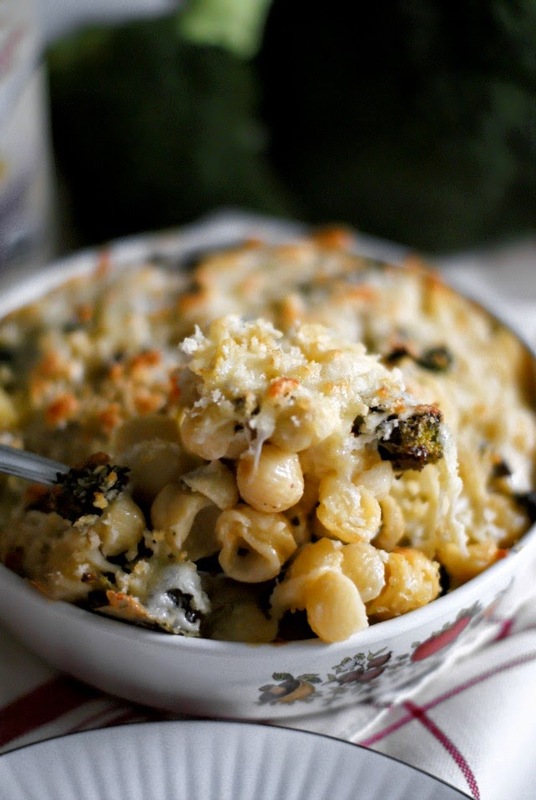 Stir the caramelized broccoli and mushrooms into the prepared macaroni and cheese. Pour into a greased glass baking dish. In a small bowl, combine the shredded cheese and the breadcrumbs. Spread the mixture over the top of the macaroni and cheese and drizzle lightly with olive oil. Return to the oven and cook for 5-7 minutes, or until the top is golden. Serves two as a main dish or four as a side dish. To find out where you can buy Horizon Mac and Cheese so that try out the MAC-N-ATOR yourself, click here: http://www.horizondairy.com/store-locator. 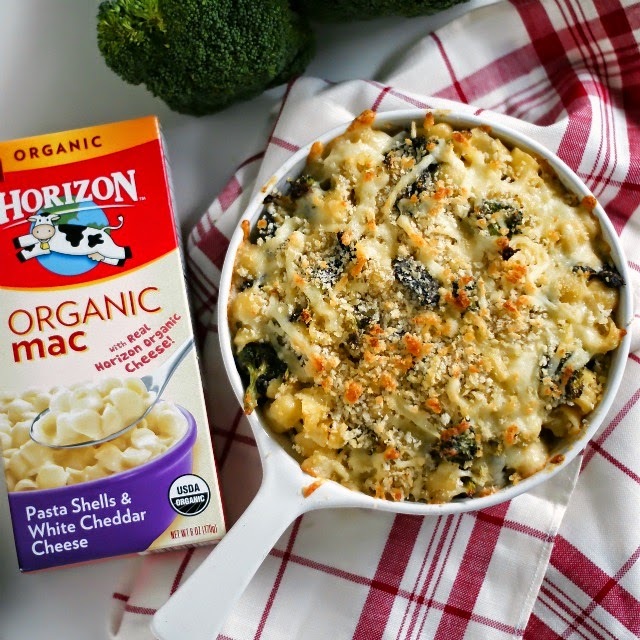 For more mac and cheesy inspiration, check out Horizon on Pinterst! I have a Pinterest board dedicated solely to mac and cheese, too. You can find it here. So love this mouth watering food. I'm a cheese lover.